Pounding rice in Orangeburg, S.C.
Rice cultivation has an unbroken tradition in small or garden plots around parts of the African Diaspora from Sierra Leone to the hill rice in Trinidad. In the old Rice Kingdom of the United States, however, where Carolina Gold once dominated, an emphasis on commercial production or plantation agriculture obscured the history of garden rice. Although commercial rice production ended in the late 1920s or very early 1930s, rice growing for personal use is nearly an unbroken tradition here too. After emancipation, when the Gullah faced a choice on whether to grow rice, relocate, or remain in place and grow other crops, many chose to be involved in rice. They maintained a connection to rice as commercial growers and garden plot growers and they sustained tradition through their foodways. A look at small plot rice growers in South Carolina establishes a connection with that aspect of the African Diaspora not only during the era of the enslavement or plantation production in the half-century or so after emancipation but well into the 20th century. At several junctures, especially in the decade that we call Reconstruction in the U.S., from 1865-1876, and again in the 20th century as commercial-scale production concluded on rice plantations, rice growers faced inflection points where they had to decide whether to continue growing rice. These contingent moments further include both a choice about sticking with commercial growing or to grow rice for home consumption. Gullah people were choosing change or continuity with rice. First we will consider the sustained interest that Gullah people had for sticking with commercial rice cultivation. Two reasons for this were that many of them had pride in place and in rice growing skill. Before we get to those reasons I want to stipulate that people like the way a field of rice looks. Agricultural people, farmers, typically admire the visuals of their crops. Growers and even visitors to the Rice Kingdom openly applauded the look of rice. Other visitors noted the visual effect of rice and the plantation fields. During Reconstruction Edward King investigated the region as a journalist and waxed eloquent on what he found. Rice fields made a strong impression upon people in part because of the geometric shapes they imposed upon the landscape and the sharp relief that the waterways provided between every cultivated square. Often, too, the terrain and agricultural patterns struck viewers because they were so different from that to which they were accustomed. When a crop or commodity is important to a particular society, residents will often have festivals and celebratory events connected to the cultivation cycle. Those who labored through the hot and mercilessly humid summer days enjoyed the brief parties of the harvest season. Rice culture required participants to manipulate land and water in ways not demanded by other crops. Judith Carney captured that well by calling rice culture a “knowledge system.” Planters came to believe that only they could manage such a complex undertaking, which added to their pride of being rice planters. Their specialized knowledge enabled them to look down upon those who grew other crops. Moreover, it added to their sense of uniqueness and led them to consider the aesthetic qualities of their land and crops. For the African Americans who associated with rice culture either through labor alone or by virtue of both employment and abode, the cessation of planting hastened a process of migration into other employments. Over time this migration eroded many of the plantation communities. Even so, some plantation communities lasted until after the Second World War. 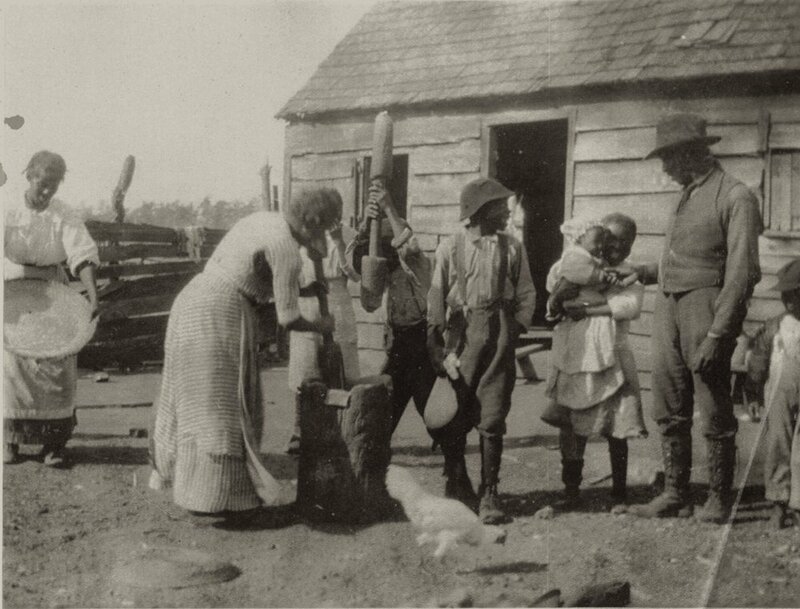 After 1900, with little employment left in phosphates, most black men that remained in the rural areas turned fully to timber, turpentine, or railroad work, employments previously pursued in conjunction with planting rice, cotton, and efforts to raise most of their own food. Others joined the ranks of the cotton tenants and sharecroppers, in some cases on the highlands of the same plantations where they had grown rice. Those African Americans who remained on the rice plantations until the industry collapsed lost more than a job. Many of them appear to have stayed on the plantation because of a sense of place or an attachment to rice culture. John Rutledge served as the supervisor of the Cheves Family plantation of Weehaw outside of Georgetown. The Cheves brothers’ focus lay with their other lands, and they allowed the houses and the banks to degrade over time. In January of 1901, traditionally the time of year when rice plantation leases were renewed, Rutledge wrote to Henry Cheves informing him of the disintegration of the plantation and of his own commitment. Rutledge and Morris demonstrate the strong sense of connection to the land, the crop of rice and suggests pride in managing the elegant system that produced it. Large plantations were not the only places of rice production in the Lowcountry, though. The plantation-scale rice culture has had a number of books written about it. But that is not the only area where rice growers raised the grain. In the Pine Barrens just inland from the tidewater, former slaves and their descendants grew rice as a provision crop into the 1930s. This sparsely settled belt was less productive than the Lowcountry, and it was easier for blacks to buy small plots of land or to find tenant arrangements on largely undeveloped pine tracts. In fact, the Black Belt enjoyed a substantial increase in black population after emancipation. Perhaps no better example of both upland rice cultivation or the sustained commitment to rice for the kitchen exists in the Lowcountry than in the vicinity of Mars Bluff, South Carolina. In her wonderful book on the subject, African American at Mars Bluff, author Amelia Wallace Vernon interviewed a number of people in the late 1980s who had learned to cultivate upland rice in garden plots. Vernon undertook an oral history project in the Mars Bluff community 50 miles above the known tidal rice cultivation area, but still near one of South Carolina’s great rice rivers, the Pee Dee. There, up to around 1920 African Americans supplemented the sharecropping of cotton with garden plots of rice ranging from about one-third to an acre in size. They planted in low ground, trusting to rain or occasionally turning to irrigation from wells. Vernon found at least one person who grew rice within the town limits of Florence, a medium size city in the state, all the way up to 1939. Some grew wetland and some dryland rice. All grew it for their own table or to share with friends and family. But in general rice growing declined in the 1920s as a generation died or others moved away as part of the great migration of African Americans out of the South. Though rice growers in the Pine Barrens did not always make the grain central to their foodways, rice did carry some of the same symbolic content that it had in the Lowcountry rice kingdom. Vernon’s research suggests that whites, more than blacks, maintained a rice kitchen around Mars Bluff. The African Americans in the area that raised rice, but only occasionally ate it, grew it because it conferred status upon them as farmers. Another method for getting at the production of rice for home use is the Census of Agriculture. For my purposes here I focused on the data for 1934 and 1939. The old rice plantation counties still had many small, non-commercial rice growers during the Great Depression, a decade to a quarter century after commercial-scale cultivation ended. For example, Beaufort County had over 400 farms reporting rice on a total of 380 acres. That indicates small plots of an acre or less in. Similarly, Charleston had 379 farms amounting to 323 acres of rice. The figures for broadly uniform for the old coastal counties. What the Agriculture Census also shows is a precipitous decline in the garden plot rice during the Great Depression. Five years later, in 1939, the number of rice farmers, acres and barrels grown had fallen by half or more in each county. As important for us to notice, though, is the inland rice production by small farmers. The chart on inland counties reveals that in 1934 Orangeburg County, pretty far inland, grew more rice than two of the counties in the rice kingdom. These were mostly small-scale growers continuing a tradition of inland production in the pine belt that had existed at least since Reconstruction. Research by Coclanis and Marlow shows that the rice growers were nearly evenly divided between black and white rice growers. Regardless of race, the dominant place of rice eating — the rice kitchen— and rice growing re-shaped society so that after emancipation both members of the African diaspora and white South Carolinians had rice as part of their agricultural and culinary heritage. That is why they kept growing it for another 70 years or more. Over the years between 1865 and 1940, one-time rice growers repeatedly asked themselves whether their economic interests, the lack of civil rights, and the allure of cities in the South or the North amounted to enough of an invitation to migrate from country to town and out of the region altogether. Migration certainly meant an end to personal rice production. A second choice was whether to keep or to let go of the rice kitchen. For those who moved to New York, Chicago, Detroit, or Los Angeles, some chose to let go of some elements of that rural past and other Americans, white and black, denigrated migrants’ dialects and culinary cultures and encouraged conformity to mass culture. Emory Campbell wrote of the “masking of Gullah culture” both outside the South and even among fellow African Americans when in Savannah. The Great Depression and World War brought many changes — and here I speculate — that the decline in rice cultivation in the 1930s is attributable to multiple causes including seed rice becoming harder to attain, land ownership loss during the depression, the disruption of the war and the economic boom afterward with lots of cheap rice. I suspect these factors worked together to bring about the decline. Today though, small rice growing has begun a rebound thanks in no small part to the work of David Shields and the Carolina Gold Rice Foundation, and chefs such as BJ Dennis who value local and heritage ingredients and from whom many others of us take our cues about food. Carolina Gold rice market farming created a unique set of foods that eventually evolved into a complete cuisine. Sweet potatoes, brassicas, oats, barley, buckwheat, benne, emmer, bread rye, wheats, maize, cowpeas, broad beans, etc. were involved at the height of 19th century science supported market farming in an elegant sequence of mixed crop rotation prior to industrialization. We have completely lost these combinations and rotations in modern times. These rice crop rotation crops formed the cuisine associated with our market farming and eventually attained stature in Europe and on our tables. We are witnessing our youth becoming aware of their own food legacies and we see them returning by the tens of thousands to their local tables nationally. This phenomenon is moving ahead with alacrity and is constant in homes, farmers markets, food kiosks, and restaurants. Everyone in the “older” generation in our major urban centers where these food systems are beginning to take hold economically, is adapting or being left behind. In the South, particularly the Virginia to Southern Georgia region, there is renewed global interest in our local food heritage beyond urban gardening and hobby cropping for the first time since the mid-nineteenth century. There are growing clusters of nascent heritage food farmers encircling our larger cities. The latest Southern entry onto the world stage sourcing quality ingredients from this movement is Husk Restaurant in Charleston and Husk’s Chef Sean Brock. Brock is equally a farmer and a chef and has been featured in major media here, in Europe and in Asia more than any other American chef over the last year. Brock’s food philosophy, garnered from his time with Dr. Shields, marries local food history and Brock’s modern locale. Brock is reviving lost foods at a rapid clip. Husk restaurant is living the Carolina Rice Kitchen and they are booked solid 30 days in advance right now. Brock is unabashedly drawing Carolina Rice and its companion foods back into the Southern pantry while the world watches. Orton should be a major presence in this grand movement toward sense of place and local identity. Simply, there is deep cultural meaning in repatriating North Carolina rice for the people of North Carolina. Our rices were always Carolina rices. They were the legacy of the Lowcountry without cultural borders. Most modern breeders are focusing upon nano and GMO seed improvement and many of our young geneticists are no longer working in the public realm. It would be folly to deny that we must address carrying capacity and the rising challenge to feed a growing global population. This is a given within our pursuits. But we are aware of adaptive weaknesses in these modern systems. The CGRF set out at our inception to explore our mission scientifically and apply the results to modern rice agriculture systems. We know that landrace cereals regress in small populations and can exhibit more vigor and new traits in large populations. We are also aware that large cereal populations increase frequency of beneficial mutation and sporting in unintuitive ways. We know that there is little chance for this genetic expression in a seed bank replication plot, especially when the stated purpose of the plot is true type replication. Our position on landrace farming is that we should all keep focused upon the mission to feed the world while leaving scientific and practical breathing room to support and study landrace plant systems that have been adapting to pest pressure and climate change in larger populations for centuries and many times millennia. The Carolina Gold Rice Foundation is following this mission to the letter. Dr. Shepard, Dr. Khush, and Dr. McClung cooperated, pro bono, to develop Charleston Gold Rice, an effort stretching nearly a decade and a half. Last year, 100 acres of commercial Charleston Gold Rice came to harvest. This year, over 300 acres of Charleston Gold rice will go in and interest is growing. We expect over 500 acres for 2013. Landrace plant systems are based upon survival through vigor and flavor. Dr. Shepard, et al, have certainly imbued Charleston Gold Rice with the best flavor traits of Carolina Gold Rice while improving its vigor and field performance four fold. One last comment. Drayton recorded over 100 varieties of landrace rices grown in the Carolinas by 1800. All of our efforts should be focused upon obtaining local landrace rice food security by diversifying beyond the two rices we have in production now. The cultural interpretation of rice husbandry at Drayton Hall, Magnolia Plantation, Middleton Place, and Brookgreen Gardens is impressive and enjoys international presence and respect. But none have working fields. Middleton Place stands alone in interpretation of Antebellum rice husbandry with a small plot of Carolina Gold rice below the butterfly ponds. The Middleton Place staff employs only authentic manual tillage with period implements, heel and toe manual planting, and manual harvest, threshing, pounding and winnowing... all with authentic implements. Middleton also engages authentic rice art and crafts, elite and common rice music and architecture within its interpretive programs. All of these historic plantation interpretive programs present and reflect upon the historic social justice issues and interpretive aspects of slavery as well. But there are no scaled up interpretation fields of heirloom Carolina Gold Rice in America and no interpretation program focuses upon the importance of separate seed protocols in landrace rice husbandry. There is a growing awareness that the massive contributions and tribulations of slavery will not be embraced with respect to Antebellum rice production until a true vista of a working Antebellum rice field in scale can be part of our national experience. Orton Plantation, of all the Antebellum rice plantations, possesses this vista if her rice fields return to their original purpose, Carolina Gold Rice seed research and production. Orton’s facility and potential presence of scale are unmatched with respect to our surviving collection of Antebellum rice field landmarks. The rapid increase of local food gardening and farming continues unabated across America. This movement is driving the establishment of mid-scale local and regional food hubs and is accelerating demand for local niche rices here in the South and elsewhere in America. In South Carolina and Georgia, these food hubs have lacked mid-scale cereal post-harvest handling and processing capabilities and there is no infra- structure for rice seed processing. In North Carolina, a similar deficit has impeded local cereal production. The Carolina Gold Rice Foundation helped develop a mid-scale heirloom rice seed cleaning, processing, and storage facility located in central South Carolina beginning in 2010.This facility is now operational. We’re not aware that there is a local fully equipped facility for heirloom rice seed or production processing in North Carolina or Georgia at this time. There is a color sorter in the 2013 budget of the central South Carolina seed facility which will bring it fully online for quality seed (a dedicated color sorter is essential for rice seed quality and weedy rice prevention management, especially in landrace rice seed systems). Regarding landrace rice seed production: There is no certified foundation rice seed production facility in North Carolina, South Carolina, or Georgia at this time, even though we have access to sufficient breeder seed stock to support at least one now. We envision the need for mid-scale certified foundation rice seed and rice production, processing and storage facilities in North Carolina, South Carolina and Georgia by 2015 based upon current growth rates and the unpredictability of rice seed supply in the United States. Orton Plantation is strategically and geographically situated to maximize rice seed and production security (if it is in production) against catastrophic loss due to storms in South Carolina, Georgia, and Texas. This was Orton Plantation’s strategic role during the first half of the 19th century as well. Without Orton, we cannot achieve rice seed and production continuity in our region in the future. The growth of acreage planted to Carolina Gold and Charleston Gold production rice is about 10 percent per year over the last four years as the market for heirloom niche rices accelerates nationally. Landrace (heirloom) Carolina Gold Rice seed and Charleston Gold Rice seed, produced in head row, breeder, and certified foundation protocols has been produced only in one facility in the USA, the Texas Rice Improvement Association in Beaumont, Texas. As of January this year, head row and breeder Carolina Gold and Charleston Gold Rice seed stock will be grown out at Dale Bumpers Institute in Stuttgart, Ark., only. TRIA will continue to produce certified foundation seed from DPI breeder. The CGRF asked TRIA to produce 300 cwt each of 2011 Certified Foundation Carolina Gold Rice seed and Charleston Gold Rice seed to serve niche landrace rice growers in South Carolina, Georgia, Alabama, and Texas. The CGRF produces an additional 300 cwt VNS rice seed per year to assist in seed availability and act as reserve against catastrophic loss. The niche rice market is growing rapidly and this season, record acreage of Carolina Gold Rice and Charleston Gold Rice will be planted in the aforementioned Southern states. These acreages are split evenly between conventional and organic rice production management. TRIA will reach their maximum security allocation for Carolina Gold and Charleston Gold certified foundation seed production in 2014. We estimate this at 500/cwt for each rice. The CGRF has capability of producing another 500 cwt VNS as a backup. Although we may have additional VNS capability for these rices, we will need additional sources for certified foundation heirloom rice seed thereafter. This overview does not account for our new variety research programs for Carolina Long Rice, a black Tribute rice and the Italian cultivar associated with first rices at Caw Caw wilderness south of Charlestowne by Italian growers in the late 1600s, tall straw Italian heirloom rices including Vialone Nano. Having only one certified foundation seed production facility for the growing number of Carolina Gold and Charleston Gold rice farmers in the South is an increasing security risk. A hurricane in Beaumont could easily wipe out a year’s seed production. Weather completely wiped out our seed crops at TRIA once in the last decade and took down half of our seed crop two years ago. The Carolina Gold Rice Foundation is funding the establishment of 50 acres of seed protocol fields off the Savannah River fed by well system and protected from coastal storm systems to a fair degree. We need Orton rice seed production for strategic security against catastrophic loss as a landrace seed facility at the very least. We also project demand for local rice in North Carolina will grow vertically, once available. We advocate for the restoration of Orton Plantation’s full array of fields for rice seed production and, especially, Orton’s larger fields because they can be deployed for scale-up field trials to be able to assess genetic stability in landrace rice seed. Although rice was planted as a market crop in the Carolina Lowcountry near Charlestowne by 1685 and proliferated North and South rapidly along the Carolina and Georgia coasts over the next century to become a major pre-revolutionary commodity export, rice did not become a distinctive American export crop with respect to its morphology, taxonomy, and unique identity until after our revolution. Dr. David Shields writes extensively about the genesis of Carolina rice in his introduction to The Golden Seed. “Some time before the Revolutionary War, the ‘Gold Seed’ rice was introduced (from what precise quarter, and how, has not been accurately ascertained) which, owing to its superiority, soon entirely superseded the white.” Dr. Shield notes that “more precise commentators pinpoint its (Carolina Gold rice) introduction to the period after the cessation of hostilities between the United States and Great Britain form 1783-1785. The meteoric rise in acreage devoted to Carolina Gold rice after our revolution followed the trajectory of improved practices characterized today as the scientific agricultural movement. Over 100,000 acres of ricelands were in production and those acres demanded pure seed. Scientific farmer/breeders moved aggressively to develop vigorous pure Carolina Gold seed to combat the increasing incidence of weedy red rice in Carolina Gold production fields. Their routines against foreign variety and weedy contamination were extensively researched and trialed after 1800. R. F. W. Allston, E. T. Heriot, and Joshua John Ward rose as South Carolina scientific breeders whose seed rices were legendary for purity and vigor in their regions. It is no small coincidence that Dr. Frederick Jones Hill, Orton’s owner from 1826 to 1854, worked closely with his South Carolina colleagues and was equally respected with regard to his research, weedy rice suppression protocols, seed selection, and market production. In short, Orton was one of only five great rice research stations strung along the Carolinas and Georgia devoted to breeding and horticultural science during that era. Orton’s many rice fields were used to develop and trial Carolina Gold rice in any scale from small isolated 100 sq. ft. rice plots to massive field trials on hundreds of acres for production. Orton Plantation, under Dr. F. J. Hill, became the vital Northern supplier of pure Carolina Gold Rice seed to support the vast market rice production across all ricelands extending deep into Louisiana beginning in 1830. Orton’s reputation for pure seed was legendary and critical to national rice horticultural advances between 1830 and the Civil War. “During the 1830s, ’40s, and ’50s, Orton Plantation was the northernmost producer of Carolina Gold rice seed, replenishing the production stock of planters nationally. The plantation’s owner during this period, Dr. Fred J. Hill, belonged to the rigorous network of planters extending from the Santee River to the Cape Fear who exchanged seed stock and policed seed purity. The entire Southern rice planting system depended upon seed produced by these breeders. Careful planters as far away as Louisiana improved their rice plantings with an infusion of “northern seed” [the 19th-century designation for production from this area north of the Santee and PeeDee] on a three-year cycle; less careful, on a six year cycle. Hill embodied the experimentalist spirit that enlivened the most successful southern planters during the second quarter of the 19th century. Because of a fire that destroyed Orton’s mill and grain processing infrastructure in 1824 during the Governor Benjamin Smith’s final years of residence, Dr. Hill, when he took possession in 1826, rebuilt with state of the art engineering the finest rice hulling and milling factory in the region. He installed gates on the water system, and created a fully functional tidal irrigation scheme on the S.C. model. He sought seed partnerships with important rice breeders in South Carolina — R. F. W. Allston, E. T. Heriot, and Joshua John Ward — to secure the best available seed stock. As the most learned of the Cape Fear Planters, he became the resource for the growers at Belvidere, Buchoi, Clarendon, Lilliput, Kendal, Hilton, and Sans Souci Plantations in Brunswick County, providing advice on insect infestation, red rice pollution of fields, and declining field production. The heyday of rice production ceased with the Civil War. Orton was declared abandoned by the Federal authorities and briefly turned over to occupancy by freedmen. The lands lay abandoned for 15 years. When K. M. Murchison secured ownership of Orton in the final quarter of the 19th century, the expense of rice planting in Carolina made in noncompetitive with high-yielding Honduran white rice planted in the Southwest. Even John F. Garrell, the greatest agricultural savant of the region after the War, could not make Sans Souci plantation’s rice (despite its superior taste, mouth-feel, and appearance on the plate) compete in the commodity market against rice from Arkansas, Texas, and Louisiana. Between 1700 and 1775 no colony in British America experienced more impressive growth than North Carolina, and no region within the colony developed as rapidly as the Lower Cape Fear. Totally uninhabited by Europeans in 1700, this isolated corner of North Carolina's southern coast is particularly noteworthy for its relatively late colonization and its rapid rise to economic prominence, first settled in 1725, the region grew to be the most prosperous in North Carolina by 1775. The study of the eighteenth-century settlement of the Lower Cape Fear is a prime example for understanding North Carolina and the entirety of colonial America as a patchwork of regional cultures (Bradford, J Wood, 2004). One family, the Moore’s, proved to be pivotal in the development of the Lower Cape Fear. During early 1700s they shaped the regions political and economic importance within North Carolina. The Moores provide an instructive if exceptional example. As the most powerful family in the region, they articulated an elite model of behavior many other families no doubt emulated. The Moores, like many other settlers, clearly developed impressive and complex kinship ties to the Lower Cape Fear. Maurice and Roger Moore were powerful men, coming from one of South Carolina’s most prominent families. Maurice’s father, James Moore, came to South Carolina from Barbados in the 1670s and served as Governor of South Carolina between 1700 and 1703. These connections insured that two of the 10 siblings, Maurice and Roger, would become wealthy and influential plantation owners. Orton and Kendall plantations were created on lands granted by the Lords Proprietors in 1725 to Maurice Moore, who along with brothers Roger, Nathaniel, and a group of settlers founded Brunswick Town (now within Historic Brunswick Town District). Maurice established lands further up river and passed ownership of the land to Roger. Although the Moore’s had originally emigrated from Ireland via Barbados, Orton and Kendall were named after the Moore’s ancestral homes in the Lake district of North of England. Roger Moore was among the first settlers to build a distinctive plantation system along the Cape Fear River. Some fragmentary business accounts reveal that by 1735 Moore already exported lumber, turpentine, and wood shingles from Lower Cape Fear. At this time Moore also traded with connections in both South Carolina and Barbados. These accounts probably provide only a small glimpse of the range of activities on Moore’s Orton & Kendall plantations. Fifteen years later, Moore’s will revealed that his resources included “Twenty Odd Thousand Acres of Land & Near Two Hundred and Fifty Slaves,” making him almost certainly the wealthiest plantation owner in North Carolina. Sometime between 1726 and 1730 Roger Moore established a modest house on the 10,000-acre site to be called Orton. The house was burned down by Cree Indians and his next home was established on neighboring land, which subsequently became Kendal Plantation. However, by 1735 he had moved his family to a more suitable brick mansion situated on the original Orton house site. Over time and subsequent ownerships the original brick structure was enveloped and extended to create a Greek Revival Antebellum house that is one of the most recognized in North Carolina today. Orton Plantation’s rice fields as seen today were constructed sometime between 1726 and 1750 together with the damming and construction of Orton pond, which was essential as a reserve to supply the rice fields with water. The pond and rice field layout is recorded on many early historic navigation plans of the Cape Fear River. Research is ongoing and current thinking suggests that the ‘back’ rice fields contiguous to Orton pond, protected by higher ground and most easily fortified against the brackish Cape Fear River, were developed first as a beta test site to experiment with rice cultivation. Due to their success, a large dike impoundment was built out into a shallow portion of the Cape Fear River. This was equipped with extensive irrigation and water control structures to modulate water levels. At the same time sluices drained the fresh water of Orton pond through a series of paddies and canals within the original “Back” rice fields to the 200-plus acres of rice fields that provide the magnificent foreground view from the front of the plantation house. Although cultivation of rice and other crops has been intermittent in the last few decades, the original system of water controls, sluices, canals, and embankments are largely in place and functional. Orton was the first rice plantation in the Lower Cape Fear Region and one of the largest in North Carolina and because of his vast land holdings, Roger Moore was referred to as “King” Roger. The amount of slave labor that was needed to build the original pond and back rice fields was significant, but with commercial success even more slaves were imported to build out and cultivate the massive front rice fields. This horrendous and cruel labor system gave way after the Civil War to large agrarian employment and eventually more mechanized cultivation. Thomas Calezance Miller: 1854-1872. Rice plantation flourishes until end of Civil War. 1860 Brunswick census lists 144 slaves in 40 houses. 1978-2010 Louis Moore Bacon (descendant of Roger Moore), as principal of parent company to Orton Plantation Holdings LLC. Current rehabilitation of National Register-nominated Orton Plantation house and gardens together with the proposed rehabilitation and restoration of the rice fields highlighted the need to connect the plantation house, gardens, and rice fields as one historic entity, hence the desire and importance of including the rice fields on the National Register. In order to understand the rice field systems as agricultural features, the fields should be considered in context of the plantation, plantation house, slave villages, kitchens, outbuildings, and burial grounds. As cultural landscapes, rice fields consist of interconnected systems of land, water, vegetation, and wildlife that differentiate them from other cultural resources. The rice grown and produced at Orton was of a high quality, fine grain which was highly prized and sought after as seed rice by the larger Southern plantations. The annual production of seed rice was critical in order to maintain the vast economies and rapid growth of rice plantations in the Southern states. Orton and other Lower Cape Fear plantations were a key factor in the maintaining the development and success of the Southern-based rice economy. Orton Rice fields have the potential to be primary sources from which researchers can gain understanding about Colonial and Antebellum periods of North Carolina and the Cape Fear Region. Orton's rice fields are the last of the many rice plantations of North Carolina. They stand as tangible record of the skill and labor exerted by enslaved laborers. Although the noted Civil War battlefields of Fort Fisher and Fort Anderson flank the southern boundary of Orton, the reason for the war itself was the demands of the slave labor practice that built and cultivated the plantation's rice fields that will hopefully be restored as its own 'battleground' testimony. In debates about who was the greatest chef working in the United States during the 19th-century, when haute cuisine came into being, the name of Charles Ranhoffer often receives mention. This French-educated culinary genius presided as chef de cuisine at Delmonico’s in New York City from the Civil War to the Gilded Age. Early in Ranhoffer’s career he spent four years, 1856-60, under F. Lefevre in New Orleans learning how to treat Southern ingredients. There he came to know and cherish Carolina Rice. In Ranhoffer’s published treasury of recipes, The Epicurean, he invariably specifies Carolina Rice when rice is featured in a dish. Wash and blanch 12 ounces of Carolina rice; drain. Take four ounces of it and cook it thoroughly in four quarts of milk; strain through a sieve. Put 32 egg yolks in a tinned basin, add two pounds and a quarter of sugar, and beat both together, then put in the rice pulp; set it on the fire and beat steadily until the preparation covers the spatula; leave stand till cold; run it through a sieve, and replace it in the basin after it has been well cleaned; lay it on ice; whip to have the mixture light, and stir in as much whipped cream. Cook the remainder of the rice in a vanilla syrup at 20 degrees; cool off, drain, add it to the composition, and freeze. If one craves more complexity of taste, Ranhoffer offers a variation with citron and truffles. Long gone, those serendipitous early evening “plates” from a nondescript home kitchen on James Island just across the Ashley River from Charleston’s famed peninsula. Secret meals, screeching hot, consumed ravenously and privately in a car. You couldn’t resist the clandestine and primal pursuit of well-being. And you brought beer for company, or, if you were lucky, some ultra-smooth, clear-beaded homemade “good” would silently appear in a jelly jar along with your plate, silver, and cotton napkin. Those plates were loaded with miraculously delicious rice casseroles concealing wild herbs, seafood netted that day by hand, or wild fowl, just shot. Your portion of rice casserole possessed the crisp caramel grains that sizzled next to the bottom and sides of the iron pot creating an impossible and delirious collision of shatter and velvet textures with each bite. There were fresh picked and stewed greens on the side, grown in the kitchen garden you walked by to get to the back door — and plenty of homemade pepper vinegar drizzled over them. Hot peppers from family saved seed came from that same garden to season vinegar made from wildly aromatic black muscadines. Hot crackling cornbread or stately biscuits with huge swipes of melting butter, churned that day, screamed to be eaten now. That biscuit wheat was grown just across the Stono River on Johns Island and the corn was in patches all over James Island and both were milled fresh weekly. Even rice was local ... pounded by hand then winnowed by fanner basket the ancient way then right into the iron casserole pot and into the oven. That oven heat roiling off your plate could hurt you if you tried to touch your food while walking back to your car. Majestic women gathered and processed these ingredients, cooked these foods and were glad to share a portion of their family supper out the back door for a dollar or two if they knew you and were confident you wouldn’t talk too much about their talent or location. This was the ultimate local food experience decades ago that spoke of rural mystery and island life. This food, a furtive swirl of Huguenot Cocotte and African culinary genius, made you swoon. This food was the pinnacle of pilau, purloo, purlow, or any other spelling you wish — the distinctive center of Charleston rice cuisine. These hidden homes and kitchens have vanished along with notions of hidden gardens — all shadows of culinary wonder along the Carolina Sea Islands. Ironically, if somehow just one could appear by magic today, the dining experience would certainly become a sought after pop-up event announced to a chosen few in code on Twitter. The unmarketed appeal of this style of food experience would be limitless. We remind ourselves that centuries of touch and intuition, in addition to chef dedication and cutting-edge culinary concept, moved Charleston into the global spotlight as a world class culinary destination over the last decade. Charleston’s culinary fame is based upon the integrity of its kitchen gardens and small farms growing the foods that created our cuisine — this alone, our local cuisine identity and its heritage, resonated with the talent of our world-class chefs. But we perceive an equally exciting future for Charleston food in local home kitchens, not just in our famous restaurants. A future that affirms the heritage of our Lowcountry family gardens and farms on a personal scale. Charleston chefs help in the genesis of our idea to increase awareness and support for the growing community of local food and gardening enthusiasts. We are excited that a few passionate Charlestonians have quietly initiated the restoration of backyard family rice gardening for all residing in the Charleston Lowcountry. This is, after all, the Carolina Gold Rice Foundation’s culinary ideal. In our view, local gardeners will inevitably grow their own rice in a region that consumes more rice per capita today than anywhere else in the South. The Carolina Gold Rice Foundation is making tons, literally — more than 15 tons to be exact — of Carolina Gold and Charleston Gold rice seed available, pro bono, to qualified growers this season. Many are small-plot backyard growers with aspirations to cook and serve the rice they grow in their own homes. The rest are scattered all across the South and even into Appalachia. Our intention is to make the Carolina Rice Kitchen, our local cuisine, accessible to home cooks, not just professional chefs, through support of personal kitchen gardens. In pursuing this goal beyond seed and growing advice, we are sharing the home kitchen traditions of the Carolina Rice Kitchen in our future newsletters. The dishes include a stunning list of easily prepared rice casseroles and rice breads and extend to more esoteric but uncomplicated ideas including rice beignets, rice custards, rice biscuits, and myriad rice scones and pastries. Until the 1980s, Charleston enjoyed the Holiday tradition of exchanging rice breads from home to home. The Carolina Gold Rice Foundation is committed to repatriating this tradition. Modern and antique recipes for Rice Pain de Mie and Rice Challah, both finished with Benne Seed, are but two of many traditional Charleston Holiday breads we will cover in future newsletters. Beyond our interest in rice, The Carolina Gold Rice Foundation plans to promote kitchen gardening of benne whose leaves and young pods are more delicate and flavorful than many garden greens and okra. We already love benne wafers and candy here, so restoring the historic culinary applications of this plant, a plant critical to successful rice farming over the long term even in kitchen gardening scale, is inevitable. Of particular interest: we wonder why no home cooks have latched onto Benne Ice Cream. It is beyond superb and unique. We prepared and served “ices” aplenty here in Charleston before the Great Depression. We will present a lovely and simple recipe for Benne Ice, among others. The Carolina Gold Rice Foundation is focused upon the day coming when the ghost of our secret kitchen is no more. We know the community of local rice cooks will return to their home tables and prepare spectacular foods that accompany rice in the field and on the stove. We will advocate for authentic rice food craft taking center stage in our homes while Charleston basks upon the world stage. In April of 2011 Charleston Gold Rice, the aromatic offspring of classic Carolina Gold, received approval for production growing — in time for planting in the 2011 growing season. The USDA approved the variety name, and The Carolina Gold Rice Foundation (CGRF) released seed for cultivation. The product of 10 years of breeding and refining by Foundation board member and Clemson University scientist Merle Shepard and rice breeder Gurdev Kush, with growouts overseen by Dr. Anna McClung, Charleston Gold combines the classic gold hulls and wholesome mouth feel of Carolina Gold, with the short stature, disease resistance and productivity of two important modern rice strains. Heeding the global turn in taste toward aromatic rice, Shepard and Kush insured that the grain would have an earthy fragrance similar to that of the best Indian rices. The qualities immediately attracted growers. At harvest time the news of the splendid crop of Charleston Gold found a ready audience in the meeting of The American Food Journalists Association at Middleton Place. Dr. Merle Shepard spoke to the assembly of the creation of the variety. The food writers had the opportunity to see for themselves the splendors of the new rice. The Charleston Post & Courier underscored the importance of the rice’s introduction in a feature article dated October 15, 2011. Before The Quaker Oat Company wheeled out its gun in 1904 and began puffing rice — before Snap, Crackle & Pop excited the ears of sleepy children in 1928, hot rice dishes graced the breakfast table. Now they have disappeared from the family table and vanished from the breakfast bill of fare. Here we will recall rice's place at the morning meal before the rise of cold cereal with milk as family fare in the early 20th century. Mix a thin batter with milk and rice-flour, adding salt, q.s. have your griddle-iron hot, grease it with lard, pour some batter on, spread it thin, turn it and brown it both sides. Of the three recipes supplied, only the last retains some familiarity in the eyes of 21st century breakfast eaters, because it it is recognizably a form of pancake. In the 19th-century griddle cakes had already become a breakfast fixture throughout the United States. Best selling cook books, such as Miss Beecher’s Domestic Receipt Book (1856), supplied guidance for a whole range of “griddles” — buckwheat, corn, rye, wheat, and rice. The cooking surface was prepared similarly for every sort of griddle. The cook heated the griddle, put a piece of salt pork on a fork, and rubbed it evenly over the surface. This method prevented excess fat from being absorbed into the cakes. Beecher did offer one exception. “Fried Rice for Breakfast” uses day old rice cut into slices and fried brown in sweet lard. When reading through Beecher‟s chapter of breakfast recipes, one learns that the Breakfast breads that Ruffin has procured from Carolina cooks belong to a category of breakfast preparations called "drop cakes," thick batters spooned into tin rounds in Dutch ovens and baked until firm. The Gallivant Rice Bread departs from the norm by eschewing eggs, a usual ingredient in this sort of preparation. Miss Beecher expanded the repertoire by adding “Rice Waffles” to the breakfast table. A tea-cup of solid boiled rice, soaked three hours in half the milk. 3 lbs of flour, 1 lb. of rice flour, 1 lb. 10 oz. of loaf sugar, 1 lb. of butter, 1⁄2 oz. of volatile salt, and 3⁄4 pint of milk, or 4 eggs, and the remaining portion milk. While breakfast rice — whether boiled, griddled, or baked — dominated regional eating in the Lowcountry, it was reckoned so iconic a morning dish that it became part of the national meal as well. In novels of the 1850s the descriptions of breakfasts may be found with some frequency. Here is a political breakfast in Washington, D.C. featuring dishes from all of the sections of the United States: “We sauntered together into one of the largest, and longest, and handsomest breakfast rooms this side of Texas. A table of great length stretched across its centre, upon which was arranged in great profusion, Georgia potatoes, New Hampshire bacon, Virginia oysters and fried eels, South Carolina rice cakes, and Cape Cod fish balls — all strong incentives to the stomach of a hungry politician.” The fame of Carolina Gold Rice and its market spanned the continent, the hemisphere, and the Atlantic by 1855. While this 1895 opinion informs us that boiled hominy had supplanted boiled rice as a southern breakfast dish, and that steamed rice had migrated to the dinner menu, the greatest point of interest is the resistance to sweetening grain porridges in general. The objection voiced here was not universal. Hominy and molasses had been a staple dish of the laboring classes from the 1830s on. Yet the preference for gravy and butter certainly dominated the middle class tables and those of gentry folk. The cookbook writers and arbiters of taste, too, frowned upon adding saccharine to boiled grits and boiled rice. This ban, however, did not extend to dishes prepared by other cooking techniques: frying or backing. Many testimonies survive to the distinctive qualities of a traditional southern breakfast — the presence of both hominy and rice — the variety of cooking technique — boiling, baking, and frying — and the conjunction of grains and meats. William Gilmore Simms, the novelist and cultural critic, reflected on its character in As Good as Comedy: “A Georgia, indeed a Southern breakfast, differs in sundry respects from ours at the North, chiefly, however, in the matter of breadstuffs. . . . Hominy itself is a breadstuff; a dish that our must but poorly represents. It is seldom eatable out of a Southern household. Then there are waffles, and rice cakes and fritters, and other things of like description, making a variety at once persuasive to the palate and not hurtful to health.” Simms noticed the familiar rice cakes. Yet adds a new dish to the southern breakfast table: the rice fritter, or rice beignet. In this light concoction, rice, sugar, spice, and eggs are transmuted into some fine by boiling lard. Boil the rice in milk with some powder-sugar, orange-flower water, a pinch of cinnamon powder, and a little butter; when quite soft put to it a liaison of yolks of eggs, pour it into a pan to cool. Make your preparation into balls, about the size of an egg, dip them in egg, fry them, sprinkle them with sugar, and serve. Jules Harder, San Francisco's great celebrity chef of the 1880s, refined this basic croquette into its most splendid form. Wash one pound of Rice in cold water and drain it. Then put it in a saucepan with two quarts of boiled milk, the peelings of one lemon and one stick of cinnamon. Cover the saucepan set it on a slow fire to cook gently, and when the Rice is nearly done add six ounces of powdered sugar and two ounces of butter and let it cook until thoroughly done. Should the Rice get too dry while cooking add a little more milk to it. Take it off of the fire, take out the lemon peelings and the stick of cinnamon, mix the Rice well together, and when it is somewhat cool, add to it the yolks of six raw eggs, a little essence of lemon or orange-flower water, (whichever may be desired). Mix it well together and put it into a buttered pan. Cover it with a buttered paper cover and let it get cold. Then roll the Rice in any croquette shapes desired, dip them in beaten eggs, then in fresh bread crumbs, arrange them in proper shape, fry them in hot lard, drain them, roll them in powdered sugar into which add a little ground cinnamon, and then dish them up on a napkin. His unsweetened version incorporated three ounces of grated parmesan cheese and six egg yolks, frying the fritters in butter rather than lard. There is something inexplicably satisfying about the lightness, crispiness, sugariness, mellowness of a beignet de riz — or the browned splendor of a rice waffle — or the filling rice griddle. Some pleasures that became passé are novel enough to become pleasurable again. Do Snap Crackle and Pop have to maintain their monopoly over breakfast. Or may their reign be ending? Charleston Gold, a short-stalked aromatic descendent of America‟s most historic rice, Carolina Gold, was approved for release by the Texas Department of Agriculture on February 11, 2011. Anna McClung of the United States Department of Agriculture, Agricultural Research Service, Rice Research Unit in Beaumont, Texas, field tested the variety over the last two years and has recommended to the state seed certification board that the variety be recognized. Bred by Merle Shepard of the Clemson University, Coastal Research and Education Center in Charleston, SC and Gurdev S. Khush, the former Head, Plant Breeding, Genetics and Biochemistry Division of the International Rice Research Institute, in the Philippines, Charleston Gold retains the distinctive gold hull and wholesome mouth feel of its famous ancestor, adding to it the short stalk stature and longer grain of IR64. A further enhancement came from crossing with IR65610-24-3-6-3-2-3, a short stalked fragrant breeding line, giving Carolina Gold an aroma for the first time. Shepard and Khush developed Charleston Gold using the time-honored pedigree breeding method — the method employed by horticulturists in the era before gene-insertion — to make improvements on the classic grain. Landrace Carolina Gold became the staple rice of the American South shortly after the American Revolution. Famously beautiful in the field and on the plate, Carolina Gold emerged at a time when culinary taste favored rice in composite dishes — pilaus, perloos, bogs, and stews — in which the ability to complement the flavors of other ingredients was paramount. Non-aromatic rices were deemed superior to aromatic varieties in the United States. During the 20th century an aesthetic shift occurred — the perfumed rices of South Asia and India — Jasmine and Basmati enjoyed rising favor in America and world wide, particularly when rice operated as a separate side dish. Dr. Shepard wondered why couldn't Carolina Gold have an aromatic version as well as the classic non-aromatic? The conviction to create a new variety had Shepard consulting with his friend and colleague Gurdev Khush, a world-renowned rice breeder, about other beneficial features that might be introduced into a new version of Carolina Gold. The old staple rice grew rather tall and historically was vulnerable to wind damage during storms. One of the innovations of the green-revolution in rice breeding was the development of short stalk rices that were not subject to blow down. Certain of these short stalked rices possessed additional virtues — great productivity, disease resistance, and rapidity of growth — a particular benefit when crops must vie with weeds in extraction of nutrients from the soil. Plant breeding has been an important on-going dimension of agriculture in America since the rise of the Agricultural Reform movement in the 1820s. The desire to improve the best cultivars in the field gave rise to many extraordinary creations. In the 1840s, for instance, Joshua John Ward, a rice planter, created a long-grain version of Carolina Gold, 5/12ths of an inch long, rather than the standard 3/8ths of an inch. This variety created a world sensation, during the sixteen years it was on the world market. It was lost with the Civil War. Charleston Gold is a new variety of the fabled grain, carrying on the tradition of Ward's "long grain" Gold Seed Rice. One of the most marked advantages of Charleston Gold is its productivity. Grown conventionally, it yields 6819 pounds per acre, compared to 3745 for Charleston Gold. (One reason that rice culture suspended in South Carolina in the 1910s was that other varieties were more productive and could be grown with less cost. Taste, not productivity, inspired the variety‟s revival at the end of the 20th century). What is even more striking is its productivity under organic growing regimens — 6060 pounds per acre, from 300-500 pounds more than major aromatic varieties currently grown. This promises extraordinary utility for planting in developing countries in which traditional agriculture is widely practiced. Shepard and Khush began their effort in 1998. After extensive testing for grain quality and disease resistance traits, the most promising strain of Charleston Gold was dispatched to Beaumont, Texas, in 2008 where Anna McClung refined the variety to seed standard and evaluated it across a number of southern growing environments. The 2011 growing season will see its debut in commercial cultivation. Biologist and rice historian Richard Porcher, Professor emeritus of Biology at the Citadel, discovered in summer of 2009 the plats describing the Pineville Rice plantation of Col.Hezekiah Mayham. Mayham, the first planter to grow Gold Seed rice in the Pee Dee region of South Carolina, was one of the two planters whose name is linked by early rice historians with the introduction of Carolina Gold to the Lowcountry in the wake of the American Revolution. With the support of the Carolina Gold Rice Foundation, Porcher and University of Georgia graduate student Hayden Smith, plans to conduct a preliminary archaeological survey of the site to retrieve seeds and plant matter. Rice geneticist Anna McClung of the USDA has been able to extract DNA from single rice grains in the past and has indicated a willingness to perform similar analysis on whatever is extracted from Mayham’s plantation. Securing the primordial Gold seed from Mayham’s upland rice fields would be greatly revealing for several reasons. Mayham’s rice strains would eventually serve as the founding seed from which Joshua John Ward, the greatest and most experimental of the antebellum rice planters, developed his world famous long grain version of Carolina Gold. During the brief 20-year period from 1840 to 1861 when that variety was cultivated, it commanded this highest price of any rice on the world market in Paris and London. It is an ambition of the CRG Foundation to genetically recreate the long Gold variety in the next decade.